I don’t need to have what others refer to as a “good day” in order to create a great life. My seemingly bad days are simply opportunities for me to demonstrate the superiority of character over circumstance. By choosing to be larger than my conditions, I teach others how to transcend their own stumbling blocks to happiness and inner peace. I don’t need my life to be easy in order for it to be exciting. My challenges are there to provoke my hidden creative powers and reveal my underestimated levels of intelligence. By letting go of my resistance to life’s difficulties and inconveniences, I transform my trials into teachers who show me how to bring a sense of flair to every moment. I don’t need to be protected from undesirable events and unpleasant elements in order to effectively achieve my goals. My contrasting experiences constitute the very substance out of which my dreams are made. By looking at unwanted conditions as the raw materials for my desires, I gain the ability to assimilate them into my creative process in meaningful and enriching ways. I don’t need to be void of enemies, critics, and naysayers in order to be validated as a person of great worth. All disapproval and contempt directed at me is only confirmation that I am effectively shaking things up and actively creating change in the world. By looking at opposition as a sign that I am challenging the status quo, I reinforce my conviction that I really am a part of an ongoing revolution to empower myself and others. I am not defined by anything outside of my own nature as an expression of The Infinite. I am not limited by anything other than the beliefs I choose to accept as a free individual. 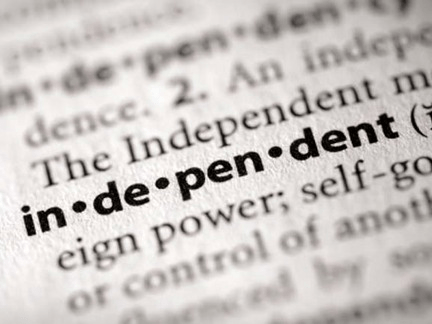 I am independent because I always get to choose what I believe, what I do, and how I express what I already am. next post: When “keeping it real” goes wrong!